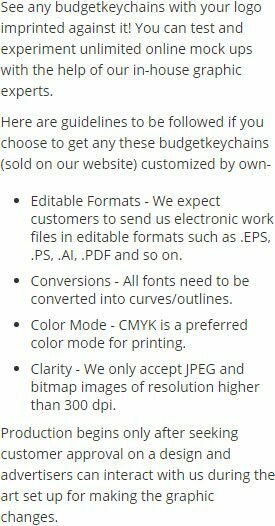 Why is customized keychain with flashlight becoming one of the hot sellers on this website? Because marketers find them affordable, reliable and customers find them highly appealing and manageable. This keychain with flashlight offers slender and sleek rectangular design and serves for 3 years (offering 100, 000 hours of lifetime). Great for managing keys and operating during travel, within homes, offices or any other cramped spaces. 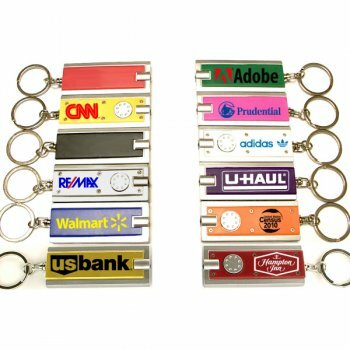 We offer easy value savings on bulk orders of this keychain with flashlight. Request a quote to know your savings on promotional LED flashlight keychain. Features – Non translucent design. Slim flashlight with super bright LED light. Flat rectangular body. Imprint space devoid of 6 black spots. Driven by lithium batteries. Product Size – 2 3/8" x 1" x 1/4"
Available Colors – Black, Blue, Burgundy, Pink, Gold, Green, Purple, Orange, White, Red, Silver and Yellow. Imprint area – 1 1/2" x 1/2", 1" x 1/2"
Imprint Area :1 1/2" x 1/2", 1" x 1/2"
Product Size :2 3/8" x 1" x 1/4"
Product & Design Quality -They look great and give off pretty good light, my customers like them! Customer Service & Shipping - It shipped right away!